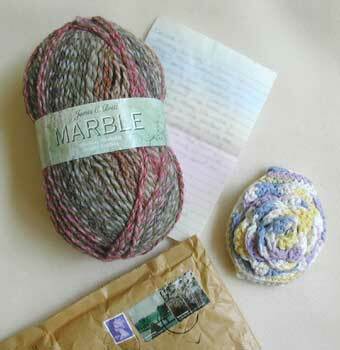 I received a lovely package yesterday from Ashleigh for the Crochetville Flower Swap. She sent a cotton bath pouf and a skein of James C. Brett Marble yarn. The bath pouf is fantastic and I will enjoy it very much! The skein of yarn is in shades of rose, blue, and copper, with an olive green strand twisted around throughout; it’s beautiful! That Marble yarn is really pretty.